In a major breakthrough, the Bangalore police has not only established Pakistani outfit Lashkar-e-Toiba’s (LeT) involvement in the December 28 terrorist attack at the Indian Institute of Science (IISc) here, but has also arrested its South India operations chief. Prime Minister Manmohan Singh today expressed concern at the “rapidly falling share” of agriculture in national income. Inaugurating the 93rd Indian Science Congress here, Mr Singh said: “While the share of agriculture in national income is falling rapidly, the share of population dependent on agriculture is not declining as rapidly. Is the Left justified in opposing the disinvestment of govt stakes in profitable PSUs? President A.P.J. Abdul Kalam has asked the Shiromani Gurdwara Parbandhak Committee to give him a list of Sikhs who have been languishing without trial in cells in foreign countries after being duped by travel agents. SGPC chief Avtar Singh, who met the President today along with Shiromani Akali Dal leaders Sukhbir Singh Badal and Sukhdev Singh Dhindsa, said that many youths from the Sikh community were facing troubles in foreign countries, including Pakistan, after being duped by travel agents who had promised them handsome jobs abroad. The Mumbai police says mafia don Abu Salem has confessed to the murder of builder Pradeep Jain. According to the police, Salem claimed to have carried out the hit on Jain on the instructions of Dawood Ibrahim and his brother Anees. The Bombay Stock Exchange’s benchmark index, Sensex, today zoomed by 149 points and ended at a new closing high of 9,539.37 on hectic buying by Foreign Institutional Investors (FIIs) as well as domestic funds. Rain and snow lashed the entire state during the past 24 hours and similar weather conditions are likely to prevail for one more day. According to the local Met office almost 71 cm of snowfall has been recorded at Dhundi in Kullu. Other places like Solang Nullah in Manali, Patsio in Lahaul Spiti and Bhang in Kullu have also been experiencing heavy snowfall. We came to know in June-July last year that herbal ayurvedic medicines prepared by the pharmacy, owned by Ramdev, contained animal material and human bones. 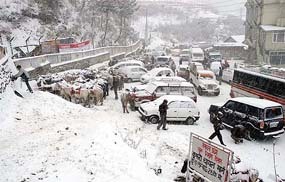 A view of Kufri market after snowfall on Tuesday. CPI(M) Politburo member Brinda Karat today once again accused yoga guru Swami Ramdev-owned Divya Yog Pharmacy of selling drugs containing animal residue, saying that the Union Health Ministry had confirmed that Ayurvedic medicines prepared by Baba Ramdev contained animal parts. 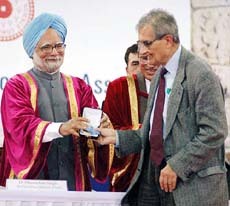 The first-ever India Science Award was conferred today on Prof C.N.R. Rao by Prime Minister Manmohan Singh here at the inaugural function of the Indian Science Congress. Professor Rao has received a gold medal, a citation and Rs 25 lakh cash prize under the award for 2004.